A telecommunications satellite for broadcasting cable and direct-to-home TV programming across Latin America and the Caribbean was blasted into orbit today atop a 20-story-tall booster rocket launched from a floating platform in the Pacific Ocean. A commercial Sea Launch Zenit 3SL booster began its successful 30-minute ascent carrying the Intelsat 21 spacecraft from a converted oil-drilling rig positioned in equatorial waters of the Pacific about 1,400 miles south of Hawaii. Liftoff occurred at exactly 0654:59.145 GMT (2:54:59.145 a.m. EDT). It was Sea Launch's 33rd mission since its inaugural flight in March 1999. The company's concept uses the planet's advantageous rotation speed at the equator to help gain velocity en route to space, increasing the amount of payload that can be carried to the orbit utilized by geosynchronous communications satellites. The two Ukrainian-made lower stages of the rocket performed their firings to propel the Russian Block DM-SL upper stage and Intelsat satellite out of the atmosphere during the initial eight-and-a-half minutes of flight. The upper stage then took over, completing a single burn lasting 11-and-a-half minutes to reach an elliptical geosynchronous transfer orbit that was targeting a high point of 22,236 miles and low point of 174 miles with an inclination of 0 degrees. The Intelsat 21 satellite will maneuver itself into a circular geostationary orbit 22,300 miles above the equator where it can match Earth's rotation and seem parked over one spot of the globe. That slot will be 58 degrees West longitude to replace the 12-year-old Intelsat 9 spacecraft, formerly known as PAS 9 for PanAmSat before joining Intelsat through a fleet merger. 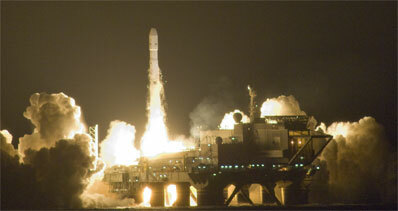 It was deployed by Sea Launch in 2000. "Intelsat 21 will meet the needs of key customers such as SKY Mexico, Turner, Discovery, Fox, Telespazio and many others," said David McGlade, Intelsat's CEO. The 13,192-pound satellite was built by Boeing using the 702MP medium-power spacecraft design and life expectancy of 15 year or more. It is equipped with a communications package of 36 Ku-band and 24 C-band transponders for video, radio, data and telephone relay services. Boeing has built 50 communications satellites for Intelsat since 1967. This was the second Sea Launch mission of the year for Intelsat. The previous mission in June, however, suffered a mysterious incident that damaged one of the power-generating solar arrays and will impact the Loral-built craft's capabilities. The next ocean-going liftoff is targeted for January to loft the Boeing-made Intelsat 27. Today's mission was the third flight for Sea Launch since the firm emerged from bankruptcy and corporate restructuring, having successfully gotten back into the business of hauling satellites to space last September. The Intelsat 21 satellite and Zenit 3SL rocket were integrated together at the Sea Launch Home Port in Long Beach, Calif., before departing for the equatorial Pacific earlier this month. The ocean-going launch pad known as Odyssey set sail first, followed later by the departure of the Sea Launch Commander vessel, which houses the launch control center, management team and official guests. Upon arrival at the launch site, Odyssey's ballast tanks were filled with seawater, dropping the platform to the launch depth of 65 feet. The Sea Launch Commander then pulled alongside Odyssey to allow workers to easily transfer between the two ships. Early Saturday, the rocket was rolled out from its hangar aboard Odyssey and hydraulically hoisted upright on the launch pedestal. Launch controllers spent the last hours of countdown making final preparations to the rocket, payload and ground infrastructure. The Sea Launch Commander moved from the Odyssey platform to a safe viewing distance about three miles away. Fueling operations got underway about two hours prior to the scheduled liftoff time as a mixture of refined kerosene and liquid oxygen was loaded into all three stages of the launch vehicle.